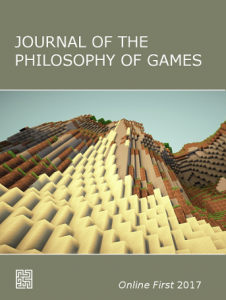 Journal of the Philosophy of Games now has its first publications available in the Online First Issue. We will publish the accepted papers as they become available in this issue, which will be converted to one or two regular issues by the end of the year. Our first article is titled “The Incompatibility of Games and Artworks” and is written by Brock Rough. The paper is utilizing a definition of games derived from Bernard Suits to argue that for an artist to intend something as a game is to intend essential constitutive conditions that precludes it from being both a game and an artwork. We also publish a book review of Stefano Gualeni’s book “Virtual Worlds as Philosophical Tools” written by Jonne Arjonta. Gualeni’s book explores the topic of how computer games can be used for philosophical reflection. Arjonta provides an overview of its main points of discussion as well as critical notes on its approach to the topic.